Reduced employee absenteeism and healthcare cost, and improved workforce fitness, productivity, and public relations. These are the promises, besides many others, that you are to make or would have made while offering your corporate wellness program to a client. Certainly, these are desired returns on investment or benefits that your client might be looking forward to achieving while investing in your corporate wellness program. However, you are not alone to offer the service, or claiming these benefits! From leading HR consulting or advisory firms to the likes of Mercer, RewardzSG, to name a few, to standalone providers of corporate wellness programs, including Wellness Corporate Solutions, GCC (Global Corporate Challenge), Sonic Boom Wellness and TotalWellness Health, all are in the fray to make the most of the growing and promising corporate wellness market. Despite the stark difference lying in their concepts to promote their offerings, they all have one thing in common: a mobile app. Wondering what makes them invest in mobile app development? Find your answers with Root Info Solutions. 1. Implement and Deploy Quickly: Staying relevant in a highly competitive age, demands an elevated level of agility and professionalism in terms of getting the request of your client honored. Once you have got a lead and converted it, next big thing is to get the program implemented and deployed successfully within a deadline. With a functional mobile app, it becomes fairly easy to get the program up and running in no time. Through an easy-to-use admin dashboard, managers and business heads can easily create user accounts, connect all employees with the scheme, and stay on the top of all with data-driven insights. In no time, the user-profile gets configured and vendors come into action. 2. Make the Program Easily Accessible: With information regarding planned activities and their health benefits, schedule, eligibility, results, and entitlements linked with their corporate wellness program available at a tap or voice command, employees, irrespective of their hierarchy, find it easier to get started with the program. It takes away the reluctance that a few people tend to develop owing to their laziness or other factors over the years being oblivious to the importance of a healthy life. Interestingly, more accessibility translates automatically into a higher engagement rate that obviously you would like to see. 3. Integrate Levels and People: A corporate wellness program is often divided into different levels that employees are supposed to achieve, and the eligibility of members to corporate offerings is subject to achievement made so. Keeping a track of the performance of the participating members through all levels is a tough ask. The complexity is set to increase further if you need to customize your corporate wellness program based on the individual’s capabilities or requirements. Thankfully, a mobile app drives the complexity away. Anyone who is authorized to make so can do it easily by just a few clicks or taps, or even with a voice command. So on the one hand, it improves the acceptability of the program, while on the other gives you freedom and time to focus on your next client. 4. Drive Employee Engagement: Employee engagement is an innate part of most of the successful corporate wellness programs available in the market today. By bringing everyone aboard at one place, a mobile app does the same job, provided it has been crafted well. Individuals and groups can see how their team members are performing. It also instills a sense of healthy competition. So a corporate wellness program has to demolish the walls of flimsy excuses that people might have built. It doesn’t need an argument why you need to do so. Remember, a friend of yours who denies joining you on a morning walk or gym on the pretext of lack of time. When people endeavor to achieve shared health and fitness goals, it also helps in strengthening the connection and inculcating a mutual trust, and that also gets reflected in their productivity and performance. 5. Manage Participating Vendors: Participation of different vendors like those related to health and fitness, hospitality, entertainment, etc. is a must in a corporate wellness program. An app-based corporate wellness program frees the business from the hassles of managing vendors and their services. Moreover, participating vendors can stay in the know of what interests members the most, and what can be done to improve the engagement or involvement of members further. 6. Reduce Business Overheads: Data decentralization, process automation, and better collaboration with stakeholders in a corporate wellness program facilitated by a mobile app contribute significantly in reducing the business overheads or challenges involved with seeking approval, staying compliant, and physical commutes, and so on. 7. Ease Tracking Achievements: Today’s CEOs or business heads adopting the program, love to keep a track on how the program is helping their business to achieve their missions: driving employee engagement, fostering a healthy and stress-free workplace culture, mitigating healthcare cost, and overall having a positive impact on the workforce productivity and business ROI. Availability of mobile analytics is a boon in this regard. When integrated correctly, it records every instance or activity of constituents. The business intelligence can also be leveraged to innovate the workplace culture. 8. Ensure Error-Free Delivery and Transparency: The automation brought about by the app-based corporate wellness program helps in eliminating human errors from the operations that might sometimes cause loss to stakeholders, or even at times derail the objectives of the program itself. It also ensures transparency in the system as everyone is aware of what s/he has to do, what s/he has achieved in the planned goals, and what remains to be achieved, and what s/he is entitled to. The vendors also know that what offerings have been claimed by whom and what not. Strengthening the relationship between different constituents, this transparency creates a win-win platform for one and all: employees gain in terms of good health and lucrative perks and benefits, corporates in terms of reduced absenteeism and improved productivity, insurance service providers gain by having fewer burdens of the health claim, and participating vendors by selling more. 9. Allow Easy Personalization: The physical fitness levels and requirements or expectations of employees at a workplace vary a lot. A corporate wellness program must embrace all. Providing flexibility to the participating members as what they expect from the corporate investment, the acceptability of a program can be improved further. However, it would be very tedious to collect feedback and recommendations from all manually, but the same becomes extremely easier with a mobile app. Members can log in and customize activities and goals based on their age and existing capabilities. A rider-based discretion can be given to employees to redeem their rewards or points that suit their requirements best. For instance, if there is a married male employee, he or she might prefer to go for a family dinner, while the unmarried counterpart might love to watch a movie on the weekend. Even in terms of corporate health offerings, their choice might differ a bit. 10. Seek and Deliver Support: Like any other initiatives, the success of your corporate wellness program depends on how responsive you are to your users or members, especially when they are in need. Fortunately, a mobile app bridges an employee well with his or her employer, vendors participating in the program, and the provider of the corporate wellness program itself. Hence, any participating or constituent member can effortlessly get answers to their queries from others, over the phone, email, chat, or through some voice assistants integrated with the app. Hope you found the information helpful. 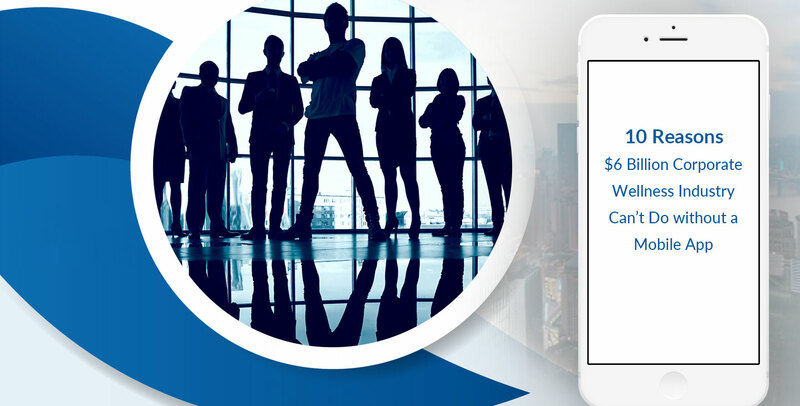 At Root Info Solutions, we have championed designing and developing corporate wellness apps for Android and iOS platform. If you have any related technology service requirement.